Hello there! It is been a while since my last post, but I have been very busy. Imagine yourself standing up on the pavement of a street, surrounded by a bunch of people opening their mouths to stuff themselves with these little things that taste heavenly and hearing things like “dos de asada, con mucha salsa y guacamole” or “me das cuatro de adobada sin cebolla para llevar”, but not understanding a thing of what that means, that is the way “El inglés”, my hubby, feels every time we go and eat tacos. He loves the whole experience, that we, Mexicans, just take for granted or for something normal. He says that there is nothing that compares of eating a taco standing up, trying to avoid to drop any of the stuffing from the taco. He thinks eating a taco is an art, a skill that not everybody posses, well, unless you are a Mexican, but I have to say that after 10 years of marriage, my lovely hubby has mastered the art of eating a taco and he is very good at it! Well done to the hubby, my Mexican at heart! This recipe is my hubby’s favourite tacos, “Al pastor Tacos”. The meat use for this tacos usually is pork and traditionally, in a taqueria (an open sort of restaurant to eat tacos) you will find the meat stuck up in a “trompo” or roller grilled. When you order an “al pastor” taco, the taquero, the guy that makes the tacos, cuts the pieces of meat, just like the Turkish people cut the doner kebab meat, and will make a taco, filled with onion, coriander and spicy salsa. The method to use a roller grilled to cook meat for tacos in Mexico was adopted because of a large Lebanese immigrant community, so thanks to them we enjoy these delicious little beauties. Traditionally the meat is stuck up in the roller grilled with a piece of pineapple on top, so when you have a taco, the taquero can put a piece of pineapple on your taco, but everybody have their own way and their own recipe. My recipe is very simple, I don’t use a lot of chillies and I add achiote, which is a paste made with annato seeds typical from the yucatan peninsula. Well, let’s start with the recipe. Happy cooking! Put the dried and deseeded chillies in hot water to soften. Once they are soft, blend them with the garlic, cumin, achiote, salt and pepper, vinegar and pineapple juice, until getting a sauce consistency. Put the pieces of pork meat in the marinade and leave in the fridge over night or at least 3 hours before cooking. Fried the pieces of pork with some rapeseed oil, trying to leave them coated with some of the marinade. Chopped the pieces to make tacos. Have it in tacos with onion, coriander and spicy salsa. If you want to do the full monty! get some very cold coronas! The chillies and tortillas you can find them in cool chile. Things always tastes better with a salsa and this is the case of pork shoulder! 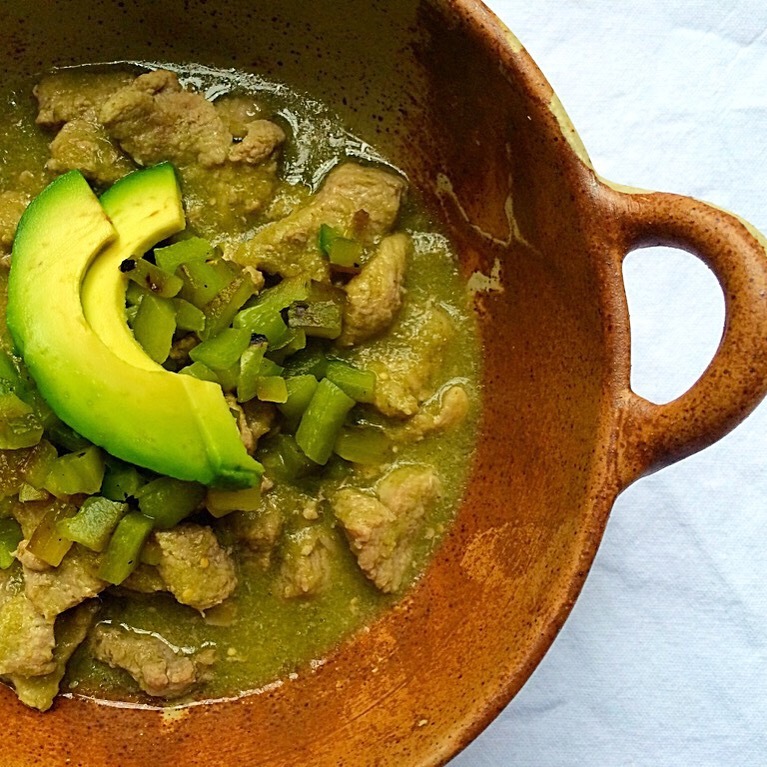 I bought pork shoulder in chunks and cook it in this amazing tomatillo salsa. 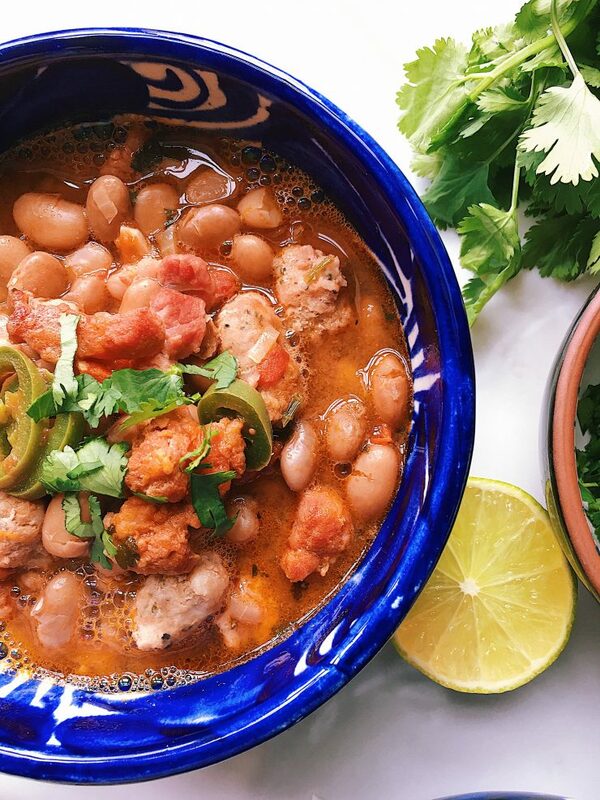 It is Friday, Fridays for me are for relaxing and that means cooking something quick and easy, but today I fancy that plus the wow factor on it, so I decided to cook this pork stew, in my family my mum loves this dish, she says that “pork just go with tomatillo salsa”. Anyway, let’s start with the recipe! Prepare your salsa verde according to the recipe that is in the blog. After you have the salsa ready, heat a casserole dish and add the oil, then add the pork shoulder chunks, add salt and cook for 10 min, add the salsa verde and cook for around 20 more min or until the meet is tender. Server it with some roasted green pepper cubes and slices of avocado and as a side dish you can have some red rice. I know everybody has its own cochinita pibil recipe and everybody claims that theirs is the best! Well, I’m not going to say that mine is the best ever, but it is good! 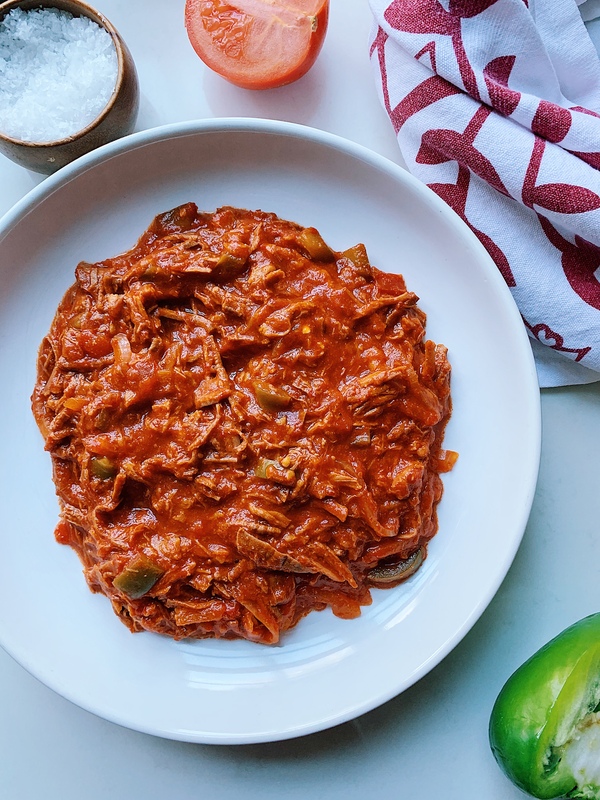 We have done cochinita pibil this way in my family since forever, it is not the traditional way, but it works for us and it never fails to impress our guests. 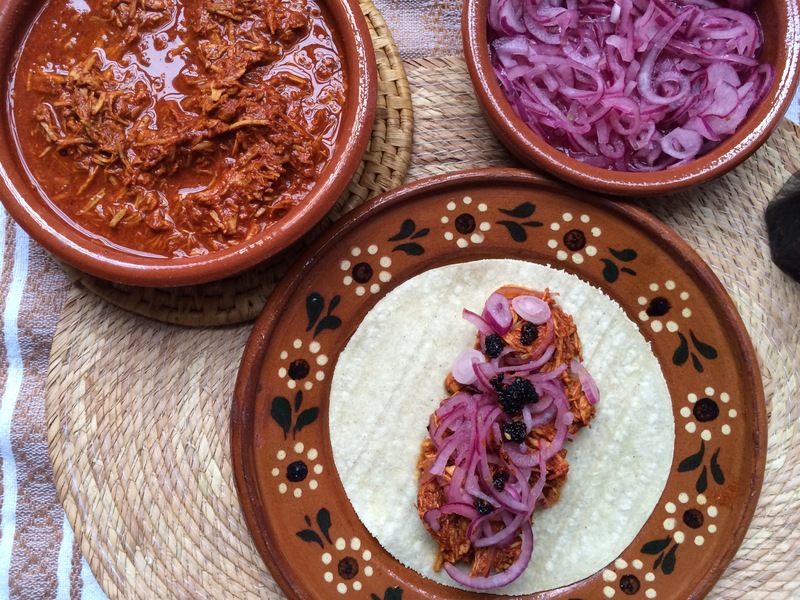 Cochinita pibil or Pork Pibil is a dish from the Yucatan peninsula of Mayan origins. Traditionally the pork meat is marinated in annatto paste or achiote, orange juice, vinegar and spices, wrapped in banana leaves and cooked in a pit for a few hours, that is where the name pibil comes from, because the word “pibil” in Mayan means “underground”. It is a simple recipe, but it takes a lot of time to get it right, the meat needs to marinate for 2 hours minimum or preferably over night and then it needs to be cook for around 2 hours at least, depending on the amount of meat. When the meat is cooked, it is shredded, then garnished with pickle onion and an habanero salsa and eaten in tortillas as a taco or accompany by black refried beans. I really hope you like this recipe, I will also tell you the way it is eaten in my family, so at the end you decide if you want to eat it the traditional way or my family’s way. 500 gr Pork leg cut in small chunks, remove all fat. 3 tbsp achiote paste or annatto. In a blender put the achiote paste, Orange juice, vinegar or lemon and oregano to blend until the achiote has dissolve. Put the meat in a large bowl, add the garlic, onion, salt and pepper and the achiote mix and leave to marinate for at least 2 hours. Then put the meat with all the marinate and 1 cup of water and turn the heat on to medium, when it starts boiling turn the heat down to very low. Cook for 2 hrs on the stove making sure it doesn’t dry. Or cover the casserole dish with aluminium foil and put it in a 200 degrees preheat oven for one hour and 30 min. Check if it needs more seasoning. Then it is done. Cut a red onion in julienne, wash through with cold water, put it in a bowl, add some salt, leave it for 10 min. Wash it again and add the juice of a lime, a pinch of oregano and salt. Leave it to pickled for 10 more min and done. Have the cochinita in tacos with some warm tortillas, pickled onion and habanero salsa or have it as we eat it in my family, in tacos with some shredded lettuce and avocado slices.